John sous vide the steak at 125F and then hit it on the grill for about 3 minutes on each side. We agree this morning that it needed to be a touch more done and he will adjust the water temperature upward on our next steak foray. Nonetheless it was really good. Since we do not eat red meat very often splurging on prime beef from Costco is a pleasure we permit ourselves. For the potato, I split it in half, score it, and rub it with olive oil, salt, and garlic powder. After 6 minutes in the microwave, John cooks it on the grill with the steak for those nice grill marks. Asparagus was $2.47/lb. this week so I took advantage. I put this in a covered pan with a little water and a pat of butter. They are done when the water evaporates and the butter coats the spears. 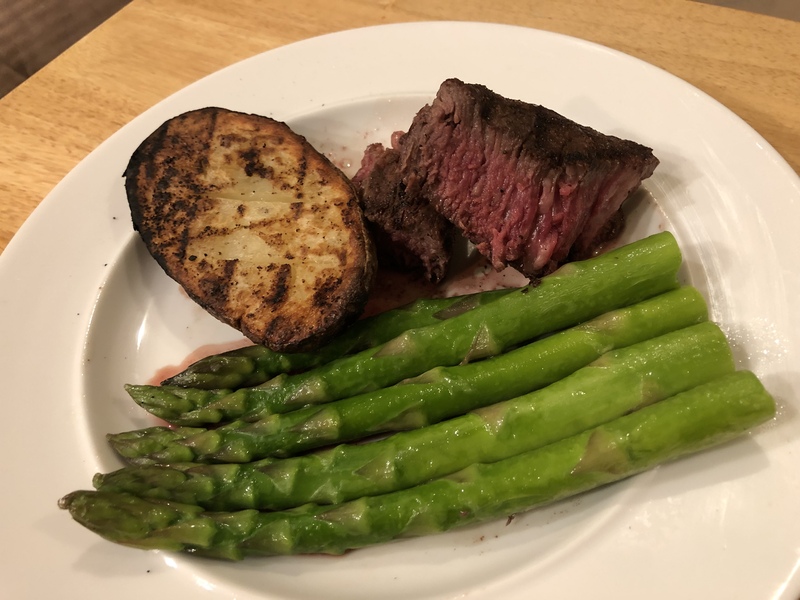 This entry was posted in American, Beef, Easy, Grilling, sous vide, Vegetables and tagged asparagus, Beef, Grilling, potato, Steak. Bookmark the permalink.